In the spring of 1776, a secret plot by British Loyalists was uncovered by American rebel patriots. The primary target was the leader of the Continental Army and the personal embodiment of the uprising against the British: General George Washington. Among the accused were several of Washington's personal bodyguards called the Life Guards, an early version of today's Secret Service. The plot, as we know, was thwarted before anyone could harm Washington, but what may be surprising is how many were involved and how easily the soldiers and civilians of the day could be swayed by bribery and drinks. Hardly anyone at that time could be trusted and practically everyone was under suspicion. Even his housekeeper, a middle-aged woman, was apparently a spy of the conspiracy! Author Brad Meltzer is a best-selling thriller novelist and he uses many techniques associated with fiction in this work of historical nonfiction. In theory I have no problem with fictional techniques in nonfiction for the sake of a good read. I think Meltzer's method works. The chapters are short, and Meltzer takes pains to dramatize every step of the plot, perhaps overdoing it a bit. Virtually every chapter ends with a cliffhanger, and while this worked well for the most part, I feel it was overdone and those cliffhangers should have been doled out a bit more judiciously. Others have mentioned the plot. Ron Chernow, for example, in his biography, Washington: A Life, but only in passing. 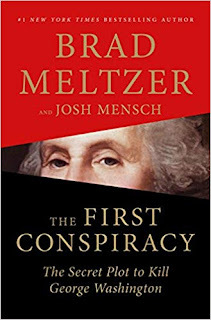 The weight of evidence and conjecture, as presented by Meltzer, indicates to me that the plot against the physical person of Washington was real and was intended to cause his untimely demise, whether by an initial kidnapping or quick murder intended to deflate the morale of the Colonial troops. History as we know it would be unimaginable if the plot had succeeded. Robert Hanssen was one of the most damaging spies in the history of the United States. Apparently, he had read Kim Philby’s autobiography at a young age and had been thinking of this “career path” for a long time. Eventually he was hired by the FBI and was given access to all sorts of secrets Russia would just love to discover—such as the names of Russians who were secretly working for the CIA. Hanssen delivered—for a price. He gave them names and information in exchange for a total of about $1.5 million. Many of the secret spies he squealed on to Moscow were executed, making Hanssen in effect a mass murderer. His secret activities went undiscovered for years and year, from the 1980s into the new century. What should make any reader angry are the lost opportunities to catch Hanssen. For example, suspicious behavior was passed on to the Chicago FBI office, only to be ignored—criminal dereliction of duty? Eventually, information that pointed the finger of suspicion directly at Hanssen was bought for millions of dollars. Enter the author of this book, Eric O’Neill. He was placed inside Hanssen’s office to surreptitiously spy on him for the purpose of gathering information for an airtight case against the spy. I had read about the Hanssen case before, but it was only with O’Neill’s book that I learned of the odious personality of Hanssen by someone who worked right next to him. Hanssen was a lit fuse, a human insult machine, in short, a walking, talking security risk that went unnoticed while he delivered secrets to the Russians in exchange for financial rewards. It is incredible that anyone who behaved like Hanssen could not have drawn intense scrutiny from day one. Knowing that Hanssen sits in a prison cell while his victims are long dead, one has the sense that justice has not been served—meaning, the punishment isn’t commensurate with the crime. Are things any better in the Intelligence Community these days? Have they learned their lessons from spies like Hanssen and Aldrich Ames? Seemingly not. We’re all heard the names of more recent spies who gathered secrets under the noses of their supervisors—Ed Snowden, and more recently, Harold Thomas Martin III, who apparently stole 300 times as much secret information as Snowden. Recent history tells us our secrets are still not safe and that the Intelligence Community is still hiring the wrong people, giving them access to information they shouldn’t have, and blissfully unaware of the damage they wreak until it’s too late. 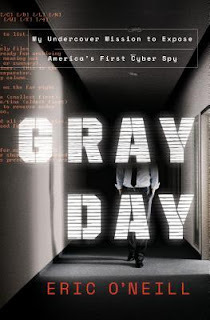 Perhaps a day in the future will arrive soon, when the evil “human element,” as evinced by Hanssen and others, is eliminated by technology, making it impossible for a human spy to steal our secrets. We aren’t there yet, as I have been reading in the news lately. "You cannot be civil with a political party that wants to destroy what you stand for." Hillary's dangerous rhetoric can only embolden violent leftists at a time when they have become far more brazen than at any time in modern history. Her words could get someone killed, yet she seems clueless that she said anything wrong and shows no signs of issuing an apology or a walkback. It says volumes about Hillary's lack of character and her unsuitability for any position of influence or authority in the US government. Our country dodged a bullet when Trump was elected over her, but she is so bitter and vengeful she wants bullets to fly on her behalf. Hillary's call for violence, couched in the euphemism "incivility," needs to be condemned by all on the political left, certainly those holding or running for public office. How many will? What we need are leaders who will dissipate violent incivility, not stokes the flames with the potential to set our nation on fire. Imagine this twisted woman as president! Her possible election to the highest office in the world, thankfully avoided, now seems more ludicrous and dangerous than ever before. Hillary and her supporters need to be kept away from the levers of power. As President Trump says, the Democrats are too dangerous to govern, and Hillary is the latest proof of that truism. 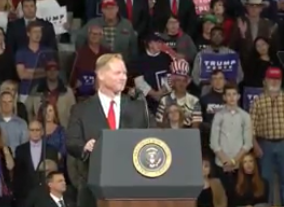 President Donald Trump held a Make America Great Again rally at the Mid-America Center in Council Bluffs, Iowa (official capacity 7,000) Tuesday night. Trump began by remarking that it has been a "historic week" with the confirmation of Justice Brett Kavanaugh, which drew a loud cheer from the audience. Chuck Grassley was singled out for praise for his role in shepherding the vote. The Democrats, he said, are talking about "packing the court with radical judges. Not gonna happen." "You don't give matches to an arsonist, and you don't give power to an angry, left-wing mob, and that's what the Democrats have become." Trump listed some of his successes, such as historic low unemployment rates. The Iowa rate is among the lowest in its entire history. Democrats have promised jobs for minorities for decades but Trump delivered in just two years. Building the wall. Funding to help stop the opioid crisis. Iowa manufacturing jobs are growing at the fastest rate in 20 years. More Americans are working now than have ever worked before. The USMCA trade agreement. A new trade deal with South Korea. Trump had promised a big announcement at the rally, and it was a change in regulations allowing sales of E15 ethanol blends in gasoline year-round--a priority for ethanol states like Iowa and Nebraska. "We're going with E15 year round," Trump said. "I made that promise during the campaign. Promises made, promises kept." "Today I kept a major promise to Iowa and Nebraska." 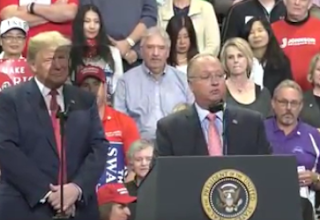 Trump stopped and asked Iowans to shout, and then Nebraskans. The shouting from Nebraskans was much louder. "All I know is you got a lot of farmers in both. And my administration is protecting ethanol. We are unleashing the power of E15 to fuel our country all years long, not eight months." Gasoline usually contains only 10% ethanol. The Environmental Protection Agency currently bans the high-ethanol blend E15 (which contains 15% ethanol) only during the summer months, claiming that it contributes to smog on hot days. Ethanol industry advocates say the claim is unfounded. Speaking at the event were Kim Reynolds, the first female Governor of Iowa; Rep. Don Bacon, running for re-election to Nebraska's 2nd District, and Rep. David Young, seeking re-election as the 3rd District congressman. 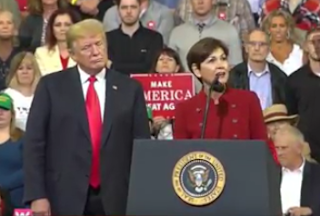 Trump's latest Make America Great rally was held Saturday night in Topeka at the Kansas Expocentre with an official capacity of 10,000, but many more stood outside unable to get into the packed house. Hours before Trump took the stage, Judge Brett Kavanaugh was confirmed to the Supreme Court by a Senate vote of 50-48. It's been an amazing week for Trump, who signed a historical trade deal (USMCA) with Canada and Mexico, along with the lowest unemployment numbers recorded in 50 years. "Just a few hours ago," Trump began after taking the stage, "the US Senate confirmed Judge Brett Kavanaugh to the US Supreme Court, and I proudly signed the judge's commission on Air Force One just before landing. This Monday night, we will perform the swearing-in ceremony for the Justice-to-be Kavanaugh, a great man. He will sit proudly alongside Justice Neil Gorsuch who is doing a great job to defend your God-given freedom." Trump blasted Democrats for their "shameless game of personal political destruction. What the Democrats did was unthinkable. They have turned into an angry mob. You've seen that today with the screaming and the shouting." The Democrats, Trump charged, "have become too extreme and dangerous to govern. America believes in the rule of law, not the rule of the mob. We're draining the swamp and we want to defeat the Democrats conclusively." Sec. of State Kris Kobach is running for Governor to replace outgoing Gov. Jeff Colyer. His opponent is Democrat Laura Kelly, a state senator. Recent polls indicate a dead heat. 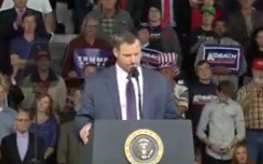 "We're worked on a number of things," Kobach said, "but the most important thing we've worked on is stopping illegal immigration. I'm so glad we have a president who gets it. That illegal means illegal." His opponent Laura Kelly, he said, has helped illegal aliens get taxpayer dollars. "It's time to put Kansans first, not illegal aliens." "I want to do for Kansas," Kobach said, "what President Trump has done for America. The time is now that we must reject the political correctness that Democrats are putting on us. We must stand up for faith in God and the United States Constitution." Steve Watkins is the Republican nominee for the 2nd District seat vacated by the retiring Lynn Jenkins. His opponent is Democrat Paul Davis. Recent polls indicate a tight battle, with the election website FiveThirtyEight currently giving Republican Watkins a 5-in-9 (53%) chance of winning. As a military veteran, "I have seen the devil and I have seen fighters," Watkins said. 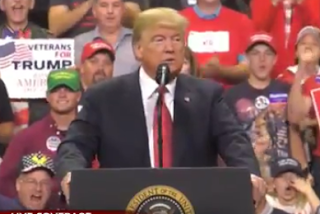 "President Trump is a fighter." "His opponent," Trump said, "voted to raise your taxes time and time again." "Every single Democrat in the US Senate has signed up for open borders," Trump continued, "and it's called the open borders bill and it's sponsored by, guess who, Dianne Feinstein. The leakin' Dianne Feinstein. Did you leak, Dianne? Democrats also support deadly sanctuary cities. Republicans believe we should be a sanctuary for law-abiding citizens. ICE are great people. They're tough. Democrats want to get rid of ICE." Trump tweaked several prominent Democrats, such as Sen. Elizabeth Warren. 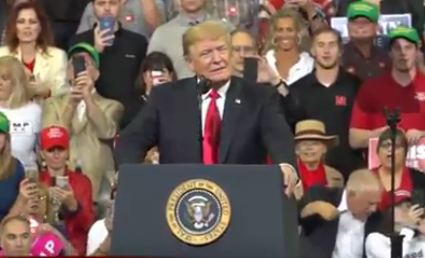 "I have more Indian blood in me than Pocahontas," Trump said, "and I have none!" He singled out for praise Republicans such as senators Chuck Grassley, Susan Collins, and Lindsey Graham for defending Judge Kavanaugh in the face of absurd attacks by Democrats. "The only reason to vote for Democrats," he said, "is if you're tired of winning." President Trump has a razor-thin margin of Republicans in the Senate and the House. Traditionally, the political party in power loses seats in midterm elections. Can Trump's massive Make America Great Again rallies in battleground states preserve his edge? Thursday night, Trump brought his populist message to Rochester, Minnesota, where House candidate Jim Hagedorn wages a tight battle with Democrat Dan Feehan for the First District seat. Recent polls show Republican Hagedorn in the lead. The seat has been held by Democrat Tim Walz, who is vacating it to run for governor. 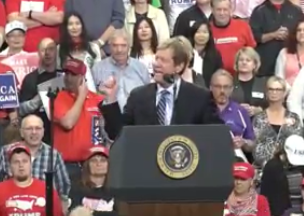 Trump's recent rallies have been designed to primarily support Senate candidates but this one included Hagedorn's battle for a House seat, as well as Republican Jason Lewis, who is the incumbent of Minnesota's 2nd District but faces a tough challenge from his Democrat foe. The First District is considered one of a handful of "swing districts" in the nation that might decide if Republicans keep control of the House of Representatives. In the two Minnesota Senate races, recent polls show Democrats in the lead. Polling for the Senate contest between Republican Karin Housley and Democrat Tina Smith, who was appointed as a replacement for the disgraced Sen. Al Franken, shows Housley is "within striking distance." Smith holds a 7-point edge but roughly 15% are undecided. In the other Minnesota Senate race, Democrat Sen. Amy Klobuchar holds a commanding lead over Republican challenger Jim Newberger. Elsewhere in Minnesota, Rep. Keith Ellison is running for Minnesota Attorney General. Democrat Ellison has been accused of physical and emotional abuse by his former girlfriend Karen Monahan. Housley has called for an investigation of Ellison by the Minnesota Office of the Attorney General. Ellison holds a slim lead in the polls over Republican Doug Wardlow. The event was held at the Mayo Civic Center, with an official capacity of 7,200. Many more watched a live stream of the event outside. "So this is supposed to be a Democrat state?" Trump asked immediately after appearing at the podium. "I don't think so. They have a very big surprise coming, don't you think?" 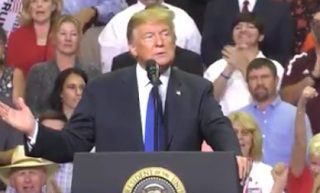 Trump defended Judge Brett Kavanaugh and expressed his hope that he will be confirmed for the Supreme Court. "He was selected because he is an incredible intellect and an incredible person." He listed many reasons why Democrats shouldn't be elected. "Democrats want to cripple law enforcement. They want to get rid of ICE. The Democrats embrace socialism. They open our borders to deadly drugs and violent gangs. The Democrats are truly the party of crime. Because that's what happens with open borders." Democrat Tina Smith, Trump said, is "never gonna vote for us. She's gonna vote for Schumer and Pelosi, and the low IQ Maxine Waters. She voted against the wall. We're making a lot of progress with the wall. Tina voted for deadly sanctuary cities. Tina Smith, that nobody ever heard of, needs to be voted out of office. And Tina Smith is voting against Judge Kavanaugh." "I want to work as a partner with you in Washington," Jim Hagedorn said to Trump. He highlighted the radical views of his opponent for the First District House seat, Democrat Jim Feehan. Democrat Keith Ellison, Trump said, recently "marched in a parade wearing a shirt that read, 'I Do Not Believe in Borders.' By the way, if you don't have borders, you don't have a country. Republicans stand by proudly with ICE and law enforcement." 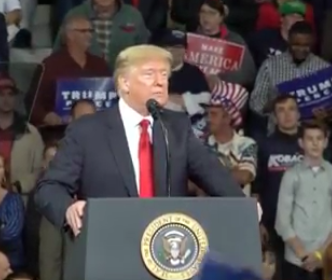 Trump urged the crowd to get out and vote on November 6 because the Republican edge in Congress is very slight. Will we return to the failures of the past or "will we continue into the future of American greatness?" One day after his standing room only rally in Johnson City, Tennessee in support of Marsha Blackburn's campaign for the Senate, President Trump arrived at another Senate battleground, Southaven, Mississippi. Polls show Republican Sen. Cindy Hyde-Smith in a tight battle with Democrat Mike Espy. The election is complicated by a second Republican in the race, Chris McDaniel, who garners close to 20% in recent polls, siphoning off support from Hyde-Smith. The rally was held at the Landers Center, with a capacity of about 10,000. The place was jam-packed when Trump arrived with many more outside the building. 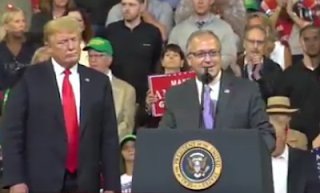 Trump touted the new USMCA trade agreement in Mexico and Canada before imploring Republicans to vote in the upcoming elections. "The only reason to vote Democrat is if you are tired of winning." He told the story of a man whose 401(k) went up 55% since he was elected. In 2016, "it wasn't me, it was all of us. But it's all fragile. The Democrats will open our borders...to criminals. The Democrats are the party of crime. Radical Democrats want to tear down our laws, demolish our prosperity in the name of socialism, and probably worse, in service of globalism." Judge Kavanaugh, he said, is hated by the Democrats, because "he will follow the Constitution as written." (The crowd immediately chanted, "We want Kavanaugh!") Kavanaugh, Trump said, has outstanding academic credentials and was predicted by many to be a Supreme Court justice long ago. But Democrats are voicing outrageous false charges against him. "Guilty until proven innocent, that's very dangerous for our country." Trump spent several minutes criticizing the news media for their attacks on him and for distorting his record. "These are very, very dishonest people." 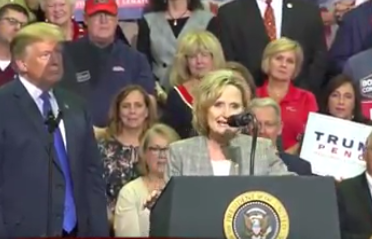 Cindy Hyde-Smith spoke for a few minutes. "We've got a lot of work to do in Washington, DC.," she said. "We've got a Supreme Court justice to get confirmed." "Cindy has voted with me 100% of the time," Trump said. 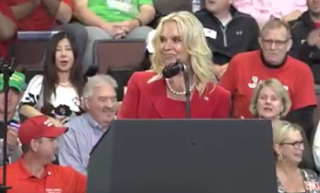 "A vote for Cindy is a vote for me and a vote to Make America Great Again." A vote for her opponent, Democrat Mike Espy, is a vote for Chuck Schumer, Maxine Waters, and radical socialism, Trump said. When Espy was in Congress, he voted for taxpayer-funded health care for illegal immigrants.